October 12 (SeeNews) - Bolivian state-run power company Empresa Electrica Corani expects the delivery of wind turbines to the Chilean port of Arica this week for the expansion of its Qollpana wind farm by 24 MW. 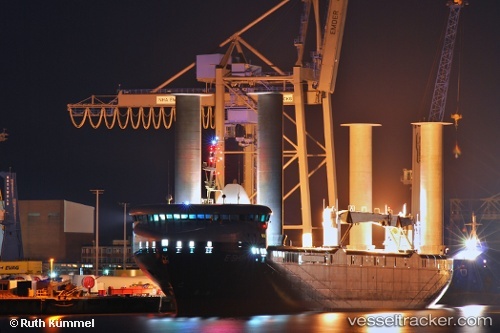 In a press release on Saturday, the company said that the E-Ship 1 vessel of German Enercon GmbH will deliver all eight wind turbines with 24 blades of 39 m (128 ft) each to the port on Tuesday. Electrica Corani already has two 1.5-MW turbines operating at the wind farm, located in the Pocona municipality, central Bolivia. In December 2014, the company contracted Spanish engineering group TSK for the expansion which is expected to generate 91 GWh a year, according to state officials. The Qollpana area has an estimated potential for 50 MW of wind power. After lengthy repairs the "E Ship 1" left the port of Emden on Feb 3, 2014, at 11.25 a.m. for the first time since January 2013 when it had docked coming from Izmir and had to be taken out of service by Enercon in Aurich due to technical problems. The diesel generators were exchanged and other improvements carried out so that the ship will again be able to carry wind farm components. The ship left the Yard Emder Werft und Dockbetriebe on Jan 28 and was berthed in the inner port of Emden until Feb 3 when it left the port bound to the German Bight.